Medical injection moulding specialist Polymermedics will increase inline measurement of customers’ components, after investing in a new Smartscope CNC 500 measurement machine from OGP. 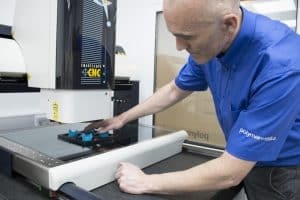 The automated, multi-sensor system is the latest in a series of metrology investments at Polymermedics’ Cornwall headquarters, increasing capacity and precision to accommodate new medical, dental and micromoulding projects, while retaining ISO9001 and ISO13485 quality processes. The new machine will work alongside Polymermedics’ existing OGP MVP-300 unit, increasing capacity while adding new ability to rapidly laser-scan surface profiles. “We’ve always been pretty obsessive about making sure validation measurements are absolutely spot-on,” Derren continues. “The new Smartscope will take that accuracy and repeatability to another level. 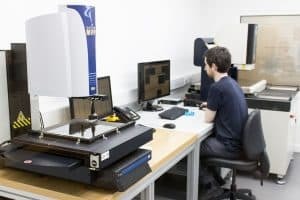 The top of OGP’s Smartscope range, Derren describes the CNC 500 as the “Rolls Royce of metrology machines”. It combines optics, laser and Renishaw TP-20 probe measurement, allowing precise, repeatable readings and rapid surface data collection – perfect for companies like Polymermedics, who produce a high volume of parts meeting demanding accuracy tolerances. Importantly, the data collected can be exported in a number of easily readable formats – including 3D CAD geometry – making it easy for Polymermedics to spot trends in inline testing over time, and understand how clients’ moulding tools are performing as production volumes increase. With a growing micromoulding order book, Polymermedics will particularly benefit from the enhanced 2 µm accuracy level provided by the CNC 500’s laser and probe sensors, while the eight LED ring light surrounding the optical edge imaging gives extremely repeatable results to within just 2.5 µm. OGP UK sales manager Graham Shaw spent two months working with Polymermedics to specify the ideal machine for the job. He believes having three kinds of sensor in one unit will prove crucial as the company continues to grow. “We worked hard to find a solution that would be as future-proof as possible. The large bed size in particular gives Polymermedics real flexibility: they can now measure parts up to 500 mm, while the option to accurately scan multiple smaller parts at once is perfect for their growing micromoulding business. The laser will prove invaluable for verifying the surface quality of their parts, too.